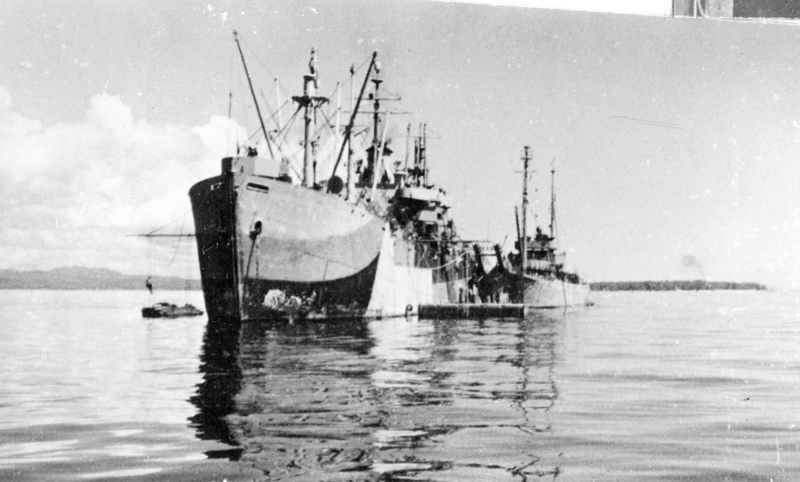 A photo showing USS Indus (AKN-1) wearing camouflage 32/1F and an unidentified net laying ship (AN) alongside. The caption identifies this as the Southwest Pacific and is undated, but the date would have to be before May 2, 1945, when Indus was painted in Measure 13. Photo source: NARA 80-G-350092. A photo showing dry-dock ABSD-2 at Manus, Admiralty Islands on April 28, 1945. 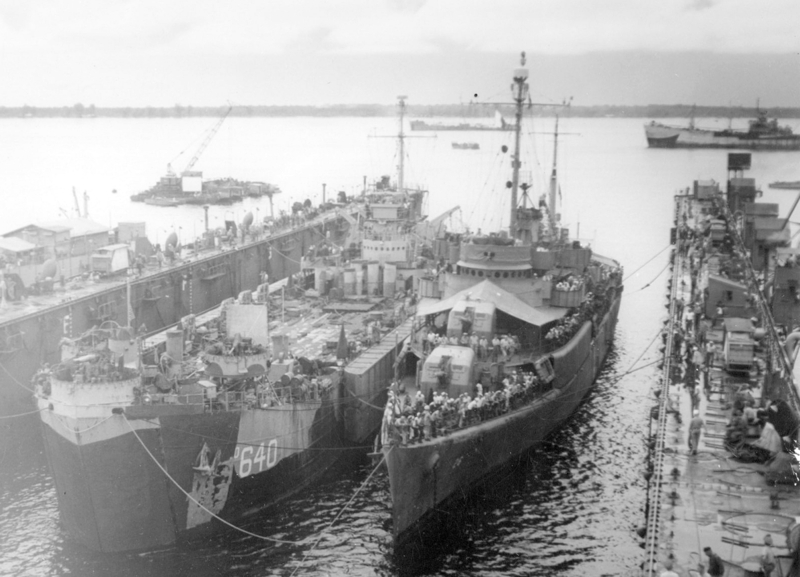 USS LST-640 and USS Half Moon (AVP-26) are entering the dock and the ship at upper right is USS Indus (AKN-1) waiting to enter. Indus is wearing camouflage 32/1F. The deck log for Indus indicates she entered ABSD-2 on April 28, 1945 and left the dry-dock on May 2, 1945. 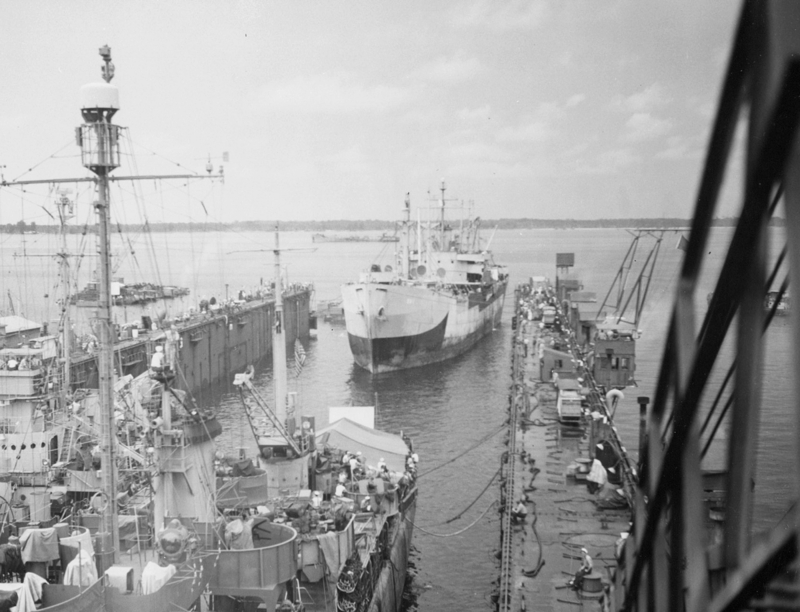 There is a photo showing all three ships in dock on May 2, 1945, with Indus now painted in Measure 13. Photo source: NARA 80-G-330658. A photo a few minutes later again of ABSD-2 on April 28, 1945. LST-640 and Half Moon are in the dry-dock and USS Indus (AKN-1) is entering the dock. Indus is wearing camouflage 32/1F. Indus entered ABSD-2 on April 28, and left on May 2, 1945. Photo source: NARA 80-G-337378. Another photo of ABSD-2 this time on April 29, 1945. USS Indus (AKN-1) can be seen in the dock and is wearing camouflage 32/1F. 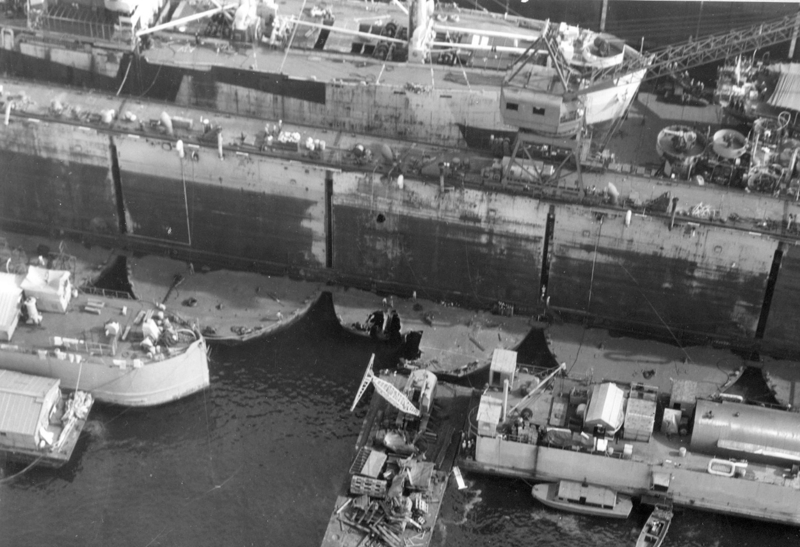 This photo shows the damaged "G" pontoon that was struck by a Japanese aerial torpedo on April 22, 1945, in the center of the view. Photo source: NARA 80-G-333557.